River Lane Ranch is excited to announce our first clinic in 2018! What a great way to start off the year, with learning how to drive & train your horses! This three-part series will teach you the foundation and fundamentals of what you need to know and so much more! Join a group of like-minded people and begin to reach your driving goals in 2018! Horses have always been a passion for Becky. She grew up on a working horse ranch where horses were used for all aspects of life. Everything from hauling logs, bringing in feed, working cattle and more. If there was a job to be done it was done with the horses. Becky has been training horses of all breeds for over 25 years in a wide variety of disciplines. Her clinics are put together so that they work best for each horse and rider to make them the most successful team possible. Driving horses is a very big part of what Becky does with all of her horses. She believes that teaching horses how to drive, makes a better, overall, well-balanced horse. Exposing them to a wider variety of situations that will benefit horse and rider. 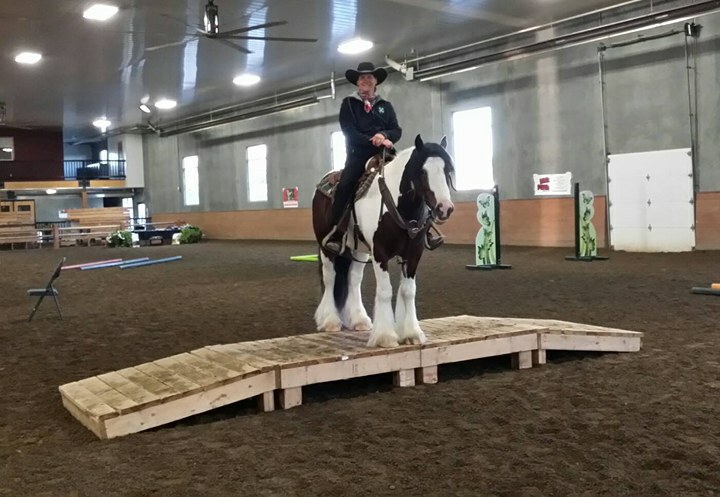 She has seen first-hand that teaching people to drive is a great way for them to connect with their horse on a completely different level. Becky’s goal is to ensure the art of driving is never lost, and new relationships are formed by building amazing teams! This weekend course will provide an understanding of the fundamentals of driving and basic horse psychology. Hands on experience in harnessing, harness fit, and options, how to get feel for the lines, ground driving, driving a single horse as well as a team. Learn how, where and why to shop for certain driving tack, how to clean your tack and more! This weekend course will allow you to safely gain the experience you need to begin starting your own horse in ground driving! You can bring your pony to this weekend if you like! Learn the do’s and don’ts’s of ground driving and how to make headway teaching your own horse to drive. Ground driving through different setups to make you most successful for when you get to the point of hooking and driving. You will get to drive a well-trained team or single horse supervised so you can get the experience of how each piece of equipment moves with the horse. 50% deposit is required to sign up and the remaining 50% due the first day of the clinic. The clinic is held at River Lane Ranch in their new 70×150 indoor arena. River Lane Ranch is located just outside of Sherwood Park Alberta, but within the city limits of Edmonton! This is a three part series clinic. You do not have to take all 3 parts, but if you are a beginner we do recommend it. The clinic is held inside. Enrollment is extremely limited so register soon. Auditors are welcome for a $25.00 fee, there are seats available. Please bring your own lunch for lunch break & we will provide drinks. The clinic have time for a Q & A where you will have an opportunity to ask questions. Clinic Cost: 299.00 per series or save 100.00 for all three.